MANILA, Philippines – The Alaska Aces managed to even the series at 2-2 after holding Travis Romeo and the rest of Magnolia Hotshots, 90-76 on Wednesday, December 12, 2018 at the Smart Araneta Coliseum. It was really hard to pick the game 4 winner as both teams were in high spirits after their respective teammates won this conference’s major awards. Magnolia’s Paul Lee notched the Best Player of the Conference while Alaska’s Mike Harris was picked as the Best Import of the Conference. As soon as the ball was tipped in, the starters were unstoppable offensively and it became a seesaw battle that delighted the crowd. Romeo Travis might not have won the best import plum but the Hotshots import erupted early in the game and topped all scorers with 13 markers to end the 1st quarter in a 22-19 note in favor of Magnolia. Seldomly used Gilas player and shooter Carl Brian Cruz opened the 2nd period and snatched the lead from Magnolia in just couple of minutes. Aside from Cruz’s scoring spree, the bruiser forward got into a heated word exchange with Travis as the players fought for positions under the rim. Surprisingly, the Alaska Aces reserves led by Chris Banchero were doing right thing and made it harder for their counterparts to catch-up with them. At the end of the 1st half, the Aces found themselves still at the helm of the scoreboard with a 10-point, 42-32 lead over the Hotshots. Magnolia really missed the generous contribution of its locals. Even though Travis had already jotted down 20 points, the usual scorers like Paul Lee and Mark Barroca were all dead silent at the start of the 3rd quarter. Coach Chito Victolero needed someone who could help his prolific import to increase his team’s chance in winning this game. Come 7th-minute mark of the third, Ian Sangalang stepped up and made a humongous effort in downsizing Alaska’s advantage. Just as the Hotshots gained the momentum, a very unfortunate event occured as Romeo Travis sustained an inch-long cut under his right eyebrow. The power forward had to leave the court so that doctors can stitch him up and get him ready to come back asap. At the moment when Travis left the floor, Magnolia’s defense suddenly collapsed. The Hotshots trimmed the lead to just 2 but it went up to a double-digit anew in the dying minutes of the penultimate quarter. 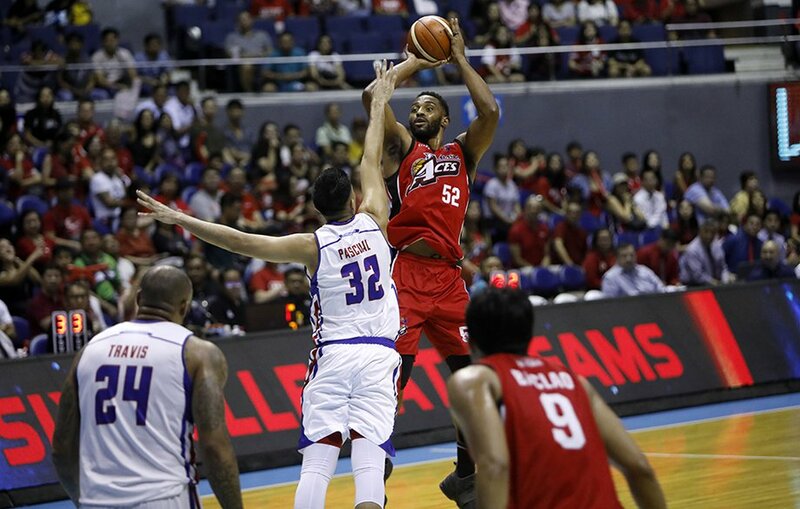 Travis Romeo got back in the game with under a minute left in the period but his re-insertion didn’t make any difference as the Aces widened their margin to 13, 63-50 entering the final chapter of game 4. Bad luck truly hit the Hotshots hard. With just couple of minutes gone by in the fourth, Magnolia’s team fouls promptly ballooned to 5. The newly crowned BPC, Paul Lee got into double figures as well with 11 points and with 5 more minutes of the game. However, Aces’ lead was still large and Mike Harris kept on dropping points on them. Things flared up between Chris Banchero and Mark Barroca in the latter phase of the last quarter. Banchero hit the deck after Barroca intentionally shoved him in the groin area with a closed fist. Unfortunately, the referees didn’t see the incident that fumed Coach Alex Compton. Magnolia tried to make a comeback at the 2-minute warning and lowered the lead down to just a single-digit but Chris Banchero didn’t want to give the Hotshots a chance to get closer as the Fil-Italian guard sank a dagger trey. Game 5 will be on Friday, December 14, 2018 at 7:00 pm. Alaska 90 - Harris 34, Banchero 17, Pascual 9, Racal 8, Teng 7, Galliguez 5, Manuel 4, Cruz 3, Baclao 3, Enciso 0, Exciminiano 0, Casio 0. Magnolia 76 - Travis 29, Lee 14, Sangalang 11, Barroca 8, Jalalon 7, Reavis 4, Brondial 2, Melton 1, Dela Rosa 0, Herndon 0. Quarters: 19-22, 43-32, 63-50, 90-76.